I know the heartache of looking for over 25 years for an ancestress who lived in the late 1800s, yet no records of her except the 1880 census exist. She was a very poor share cropper and her story would be lost to all time if it weren’t for me, her 3rd great grand daughter who was born 120 years later. So I can’t imagine what it would be like to try and trace a black ancestor through the wills and deeds of some unknown master, when you really don’t even know where to begin or what name to look for. So when Schalene Dagutis of http://tangledrootsandtrees.blogspot.com/p/slave-name-roll.html decided to start a slave name roll call of slaves we have found in the homes of our ancestors, I decided I would participate. Who knows, maybe someone out there is looking for this very family. I Will first that my just debts be paid and then I first give unto my son Hiram Edde one dollar in addition to what he has already received and secondly I give unto my son Moses P. Edde one dollar in addition to what he has received and thirdly I give to my daughter Fanny M. Enochs one dollar in addition to what she has received and fourthly I give my daughter Patience Rees one dollar in addition to what she has heretofore received. I Will that my plantation remain in possession of my wife and my minor heirs until the youngest child become of age that is to say during my wifes (sic) widowhood and if my wife should marry this Will to be void as to her but remain as to my minor heirs. I Will that my boy Ben. and boy Cain and my woman Kisiah and Hanner, remain upon the plantation for the benifit (sic) of my Wife and the raising of the minor children, the balance if any to be sold or divided the balance of the negros aside from those above named to be sold or divided. I Will that my son Mitchell have the privaledge (sic) to remain upon the plantation with his mother until my youngest child becomes of age and have the fourth part of all property that is raised with the hands, I have left with my wife. He is to have the privaledge (sic) of raising stock for himself and not to be transferred to no other person. I Will also the Negros that I Will to remain upon the plantation with my wife and minor heirs fall immediately into the hands of my executives when the youngest child comes of age for the be sold or divided as the balance and I further Will that if my Wife is living when my youngest child becomes of age and remains a widow she is to occupy my dwelling and have sufficiency for her comfortable support and somebody to wait on her her lifetime or Widowhood apart from the above Will. And appoint my sons Mitchell and William my executives to this my last Will and Testament. Signed sealed in the presents of us, Sept. 8th, 1850. He left behind the slaves Kisiah, Hanner, Ben and Cain to the benefit of his wife, the rest to be sold immediately. On 29 Dec 1858, Mitchell Edde, James’s son, sold to Daniel A. George,a portion of the slaves. This indenture made and entered into this 29th day of Dec. 1858 between Mitchell Edde of the one part and Daniel A. George of the other part and both of Lincoln County, Tennessee witnesseth that the said Mitchell Edde for and in consideration of the sum of One Hundred and Seventy Five Dollars to him in hand paid (the receipt of which is hereby acknowledge) hath bargained and sold doth hereby transfer and convey to said Daniel A. George all the rights title and interest which he said Mitchell Edde has under the Will of his father James Edde Deceased, to the following described property- being an interest of one eighth in the same- To Wit: one tract of land situated in Civil District No. # 1, Lincoln Co., Tenn. containing by estimation 170 acres be the same more or less. Bounded on the North by the land of Jno. Bird, on the East by the lands of Daniel Brown Deceased, on the South by the land of ? Sikes Deceased. On the West by the land of Susan Parks and Samuel Bobo, said land being now in the possession of the Widow of said James Edde, and to be held by her until her right expires under the Will of said husband James Edde Deceased. Also the one eighth interest in the following Slaves and their increases. Benjamin aged about 60, Cain aged about ? ?, Kizza age about 50, and Hannah aged about 20, those said slaves being now in the possession of said Widow and to be held by her until her rights expire under the Will of her said husband. Also the entire interest which the said Mitchell Edde may have in the stock of every description under the Will of his father aforesaid. To have and to hold the entire interest in said land and Negros and stock of the said Mitchell Edde, to the said Daniel A. George, his heirs and assigns forever- and the said Mitchell Edde hereby binds himself, his heirs and personal representatives, to warrant and forever defend the title to the above described one 8th interest in said land and slaves, to the said Daniel A. George his heirs and assigns against the lawful claims of all persons whatsoever- In witness whereof the said Mitchell Edde has hereunto set his hand and seal the day and year first above written. So what happened to these slaves? Well, we know that Sarah Edde was still alive in 1860, because she is enumerated on the 1860 Lincoln County, TN Federal Population census, so the slaves were still in her possession then. Her youngest daughter was born ca 1841, and would have still been considered a minor. Here is the family in 1870 Lincoln County, TN. I could not find a marriage record for Hannah in TN. Not sure if she married and is living elsewhere or has already passed away. 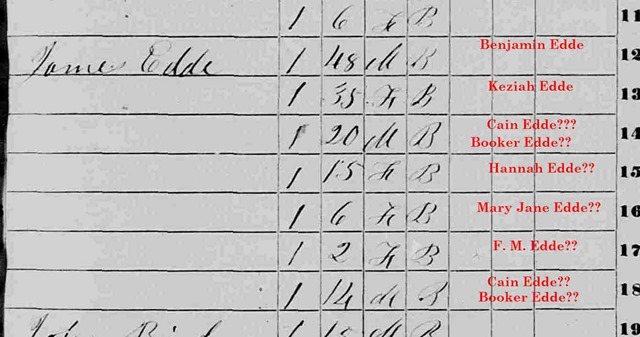 If we look at the children of Benjamin and Keziah Edde, we notice that Booker was born ca 1831, Mary Jane was born ca 1839, F. M., was born ca 1849 and they are not mentioned in the Edde will, yet it appears that they were living on the Edde farm in 1850. We have to assume that they were meant to be sold off after James’ death, since he says, “balance of the negros aside from those above named to be sold or divided.” Yes, it appears that in 1850, when he wrote his will, James Edde intended to sell six year old Mary Jane and 2 year old F. M. Edde away from their mother and father. Why he did not plan to keep the teenaged Booker is unclear. It looks like after being emancipated, Ben and Kizzie reunited their family. I do not have the probate records for James Edde, so we have to assume that his Executor sold these slaves after the death of James Edde. Most likely members of the family purchased them, as it is assumed they stayed in the area. By 1880, Cain and Rhoda are living in Moore County, TN. Benjamin and Keziah are living in Bedford County, TN and are enumerated under the surname Eady as is most of my family living in the area. They are 79 and 71 years old. From slaves to free in their old age. Previous Post Genealogy Go Over-The Epiphany…..
Next Post Will The Real William Blaylock Please Stand Up?…. Amazing post. Thank you for sharing this part of your family’s history. You made certain those slaves will not be lost. Their descendants will cry tears of joy when they find them. Thank you for contributing to the Slave Name Roll Project. You did a wonderful job! Wonderful that you followed through and didn’t stop at the will. across them in 1870 and since they kept the surname, it made me wonder what happened to them, so I followed them a bit. I did a little more research on them, for the article as well. I wish I had done my posts earlier in the month. Schalene would have gotten the idea earlier and we would be seeing posts like yours all through the Black History Month. But maybe this way people will do them all through the year and not wait for next February. Great researching job Teresa. Thanks Cathy. I don’t know when or where James got Benjamin and Keziah, but at least I have tied them to their last owners. What a wonderful post! You have done a great job researching this family and making sure that they will not be lost. It’s great to find another participant in the Slave Names Roll Project. What a blessing your contribution will be to descendants of the Edde Plantation. I will add your blog to the post I wrote earlier today. Thanks again for your contribution. Cain & Rhonda Edde were my great-great Grandparents through their daughter Rosa/Rosie. I don’t knkow what else to say right now other than THANK YOU SO MUCH. Oh my gosh, I have tears! I never thought I’d meet a descendant! This is so amazing. You are welcome. Do you have any pictures, I’d love to meet them!!! We have another success story! It’s wonderful when you hear from someone descended from the enslaved people. Congratulations to both of you. Thank you so much for this post. I have forwarded a copy to a young woman who is reaching the Eady family. My own research leads me to believe that her husband is the ggg grandson of Cain and Rhoda through their son, Isham/Isom and grandson, James Henley Eady. Wonderful!!!! I so hope it helps her research. They were amazing people to keep their family together.